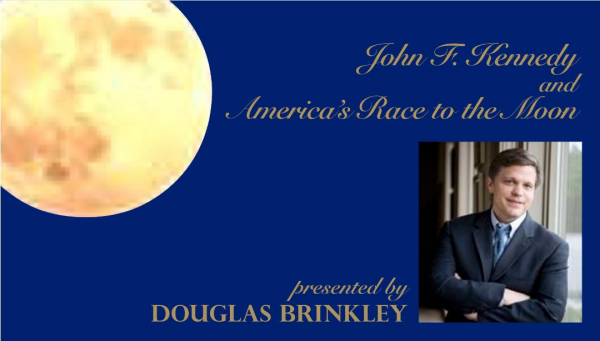 The 21st Annual Brendan Gill Lecture to feature Award-Winning Presidential Historian Douglas Brinkley discussing President John F. Kennedy and the 50th Anniversary of America’s Race to the Moon. Browse: Home » Events » Events » The 21st Annual Brendan Gill Lecture to feature Award-Winning Presidential Historian Douglas Brinkley discussing President John F. Kennedy and the 50th Anniversary of America’s Race to the Moon. The Bronxville Historical Conservancy is delighted to announce that award-winning historian and New York Times bestselling author Dr. Douglas Brinkley will present the 21st Annual Brendan Gill Lecture on June 7, 8:00 p.m., at the Bronxville High School auditorium. Brinkley is the Katherine Tsanoff Brown Chair in Humanities and Professor of History at Rice University, a CNN Presidential Historian, and a contributing editor at Vanity Fair. Brinkley’s previous publications have garnered numerous awards including the Sperber Prize, the Robert F. Kennedy prize, the Arthur S. Link-Warren F. Kuehl Prize, the Benjamin Franklin Award, and the Theodore and Franklin Roosevelt Naval History Prize among others. He has received honorary doctorates from numerous institutions of higher learning as well as Ohio State University’s Humanities Alumni Award of Distinction. Brinkley also has a passion for jazz, folk, and rock ‘n roll music. In 2007, he won a Grammy Award for co-producing Presidential Suite: Eight Variations on Freedom and was nominated for a Grammy for Gonzo, his collaboration with Johnny Depp on the soundtrack for Alex Gibney’s documentary on American journalist and author Hunter S. Thompson. In the world of public history, Brinkley works in many capacities including boards, museums, colleges, and historical societies. He is a member of the Century Association, the Council on Foreign Relations, and the James Madison Council of the Library of Congress. The Chicago Tribune dubbed him “America’s New Past Master,” and CNN proclaimed Brinkley, “a man who knows more about the presidency than any human being alive.” The New-York Historical Society has chosen Brinkley as its official U.S. Presidential Historian. The Bronxville Historical Conservancy presents the Brendan Gill Lecture each year as a gift to the community. The lecture is named for former Bronxville resident, editor and writer, Brendan Gill, who was a champion of architectural preservation and other visual arts. To register for this free public lecture, email: events@b-h-c.org or call 914-961-6790.